Get to Know our New Executive Director, Alyssa! It is with greatest pleasure that Team Pengyou would like to announce that Alyssa has taken on the position of Executive Director for Golden Bridges and Project Pengyou! Over the past year, Project Pengyou has experienced a lot of growth and changes. What started as an online platform providing China study resources and connecting alumni of US-China exchange programs has expanded to also include a vibrant network of campus chapters across the US, led by American and Chinese youth leaders. Throughout all these changes, we have been extremely grateful to have Alyssa Farrelly on the team, previously as our Senior Program Manager. Alyssa’s unwavering dedication, passion, and talent has been a huge reason behind the successful expansion of Project Pengyou from an online program to an offline movement, and will undoubtedly be a huge part of our success in the future! It is with greatest pleasure that Team Pengyou would like to announce that Alyssa has been appointed Executive Director for Golden Bridges and Project Pengyou! Bio: A New Jersey native, Alyssa graduated with a BA in International Studies and a minor in Mandarin. She studied abroad at Peking University in 2009 and fell in love with China, vowing to return to live and work there. Alyssa joined the Golden Bridges Foundation team in 2012. 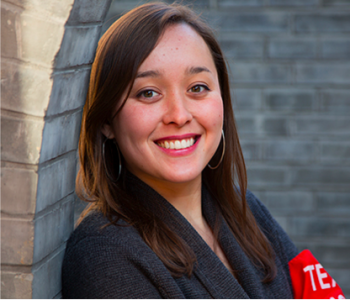 Prior to the Golden Bridges Foundation, Alyssa interned for several NGOs, served as business development manager at a Chinese travel start-up and taught English. She is also currently a Heyrobics instructor, a popular fitness group in Beijing and the Chapter President for the American University Beijing Alumni Club. She speaks Mandarin and Japanese. What drew you to China? I wanted to learn a new language in college and having grown up speaking Japanese, I thought Chinese might be slightly easier to pick up! I had a specific interest in Asia for my international relations major and studying abroad in China seemed like the best way to explore a completely foreign country and perfect my language skills. I took the leap to study abroad at Peking University for 4 months which unexpectedly transformed my vague interest into a passion for Chinese, love for Chinese culture and desire to build a career in China. After college, I immediately moved to Beijing and have been here ever since. Over 5 years later, I continue to learn and challenge myself here everyday. How did you initially find out about Golden Bridges and Project Pengyou? I met Holly through a mutual friend and was invited to attend a fireside chat event at the Project Pengyou Courtyard soon after. I remember that event very vividly as Evan Osnos was the special guest speaker and hearing his various China stories as a journalist was really inspiring. After finding out more about the organization, I felt particularly drawn to the mission to empower a rising generation of US-China bridge-builders between the US and China, as I was also a 朋友. 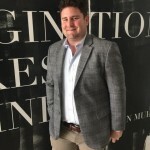 I had studied in China and had a transformative experience, but upon returning to the US, I found that others didn’t understand China the way I did and there wasn’t really a way to continue my engagement with China. This motivated me to find a way to continue growing mutual understanding between Americans and Chinese and also work on mission-related work. Project Pengyou seemed liked a great fit and I was fortunate enough to join the hardworking, tight-knit team. It has been an amazing journey over the past three years at Project Pengyou and I love waking up every morning with a smile on my face, excited about what we do and what’s to come. What is your favorite China-related book? What Chinese food could you eat everyday? I learned how to ride a unicycle before a bicycle! 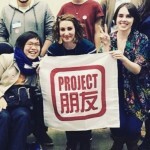 Alyssa will be following Project Pengyou’s founder, Holly Chang, who has recently taken on the role of acting executive director for the Committee of 100 and splits her time between China and the US. Although Holly is no longer the executive director of the Golden Bridges Foundation, she remains president and chair of the board. 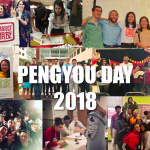 The Project Pengyou team has always been small but hardworking and able to roll with the punches, and although we have grown a lot over the year, our mission to empower young leaders to build bridges between the US and China has not changed. With Alyssa as our new Director, we are excited about what’s in store for the future of the Foundation and the Project Pengyou initiative!